Ophelia is a fictional character in the play Hamlet by William Shakespeare. She is a young noblewoman of Denmark, the daughter of Polonius, sister of Laertes, and potential wife of Prince Hamlet. In Ophelia’s first speaking appearance in the play, we see her with her brother, Laertes, who is leaving for France. Laertes warns her that Hamlet, the heir to the throne of Denmark, does not have the freedom to marry whomever he wants. Ophelia’s father, Polonius, enters while Laertes is leaving, and also forbids Ophelia to pursue Hamlet, who he fears is not earnest about her. In Ophelia’s next appearance, she tells Polonius that Hamlet rushed into her room with his clothing askew, and with a “hellish” expression on his face, and only stared at her and nodded three times, without speaking to her. Based on what Ophelia tells him, about Hamlet acting in such a “mad” way, Polonius concludes that he was wrong to forbid Ophelia to see Hamlet, and that Hamlet must be mad because of lovesickness for Ophelia. Polonius immediately decides to go to Claudius (the new King of Denmark, and also Hamlet’s uncle and stepfather) about the situation. Polonius later suggests to Claudius that they hide behind an arras to overhear Hamlet speaking to Ophelia when Hamlet thinks the conversation is private. Since Polonius is now sure that Hamlet is lovesick for Ophelia, he thinks Hamlet will express love for Ophelia. Claudius agrees to try the eavesdropping plan later. The plan leads to what is commonly called the ‘Nunnery Scene’. Polonius instructs Ophelia to stand in the lobby of the castle while he and Claudius hide. Hamlet enters the room, in a different world from the others, and recites his “To be, or not to be” soliloquy. Hamlet approaches Ophelia and talks to her. He tells her “get thee to a nunnery.” Hamlet becomes angry, realizes he’s gone too far, and says “I say we will have no more marriages”, and exits. Ophelia is left bewildered and heartbroken, sure that Hamlet is insane. After Hamlet storms out, Ophelia makes her “O, what a noble mind is here o’erthrown” soliloquy. The next time Ophelia appears is at the ‘Mousetrap Play’ which Hamlet has arranged to try to prove that Claudius killed King Hamlet. Hamlet sits with Ophelia and makes sexually suggestive remarks, also saying that woman’s love is brief. Later that night, after the play, Hamlet kills Polonius during a private meeting between Hamlet and his mother, Queen Gertrude. At Ophelia’s next appearance, after her father’s death, she has gone mad, due to what the other characters interpret as grief for her father. She talks in riddles and rhymes, sings some “mad” and bawdy songs about death and a maiden losing her virginity. After bidding everyone a “good night”, she exits. The final time Ophelia appears in the play is after Laertes comes to the castle to challenge Claudius over the death of his father, Polonius. 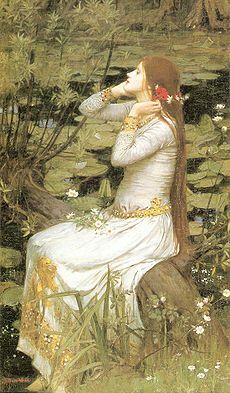 Ophelia sings more songs and hands out flowers, citing their symbolic meanings although interpretations of the meanings differ. The only herb that Shakespeare gives Ophelia herself is rue; “… there’s rue for you, and here’s some for me; we may call it herb of grace o’Sundays; O, you must wear your rue with a difference”. Rue is well known for its symbolic meaning of regret, but the herb is also highly poisonous and has powerful abortive properties. 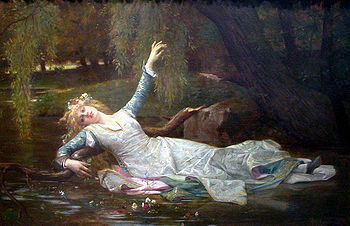 In Act 4 Scene 7, Queen Gertrude, in her monologue (There is a willow grows aslant the brook), reports that Ophelia had climbed into a willow tree, and then a branch broke and dropped Ophelia into the brook, where she drowned. Gertrude says that Ophelia appeared “incapable of her own distress”. Gertrude’s announcement of Ophelia’s death has been praised as one of the most poetic death announcements in literature. We later see a sexton at the graveyard insisting Ophelia must have killed herself. Laertes is outraged by what the cleric says, and replies that Ophelia will be an angel in heaven when the cleric “liest howling” in hell. At Ophelia’s funeral, Queen Gertrude sprinkles flowers on Ophelia’s grave (“sweets to the sweet,”) and says she wished Ophelia could have been Hamlet’s wife. Laertes then jumps into Ophelia’s grave excavation, asking for the burial to wait until he has held her in his arms one last time and proclaims how much he loved her. Hamlet, nearby, then challenges Laertes and claims that he loved Ophelia more than “forty thousand” brothers could. After her funeral scene, Ophelia is no longer mentioned.